Rider Certificates. Gaining knowledge of grooming, feeding and care of horses. Throughout their Pony Club career, riders are encouraged to undertake various efficiency tests according to their age and ability - commencing with the basic ‘D’ Certificate through to the ‘A’ Certificate. 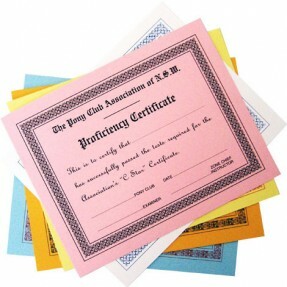 These certificates aim to encourage the interest and improvement in knowledge of its members. They are viewed as a measure of a rider’s progress in their overall efficiency. In working for them riders acquire valuable knowledge and skills, which enhance their riding experience. A copy of the Pony Club Australia Syllabus of Instruction should be obtained by each member as this contains all information relating to the requirements for tests. ‘Riding’ is also an excellent reference manual for riders and parents as it contains information concerning all aspects of riding and horse care. These can be purchased through the State Office. Candidates have reasonable control of their ponies at the walk and trot. Some help may be given, such as allowing ponies to work in company. Minimal help can be given with other tasks. Elementary knowledge of grooming, feeding and general care of the horse. Basic riding ability. Further knowledge of grooming, feeding, care of horses, parts of the horse. More capable riding ability. Independent seat required, with correct aids and a degree of competence in other aspects of riding. General knowledge of horse care and parts of the horse. Active riding skills at a fast pace, using a correct, strong seat, well established in forward jumping position. Good horse knowledge. Action activities and a 40km ride. Active, capable rider who understands the aids thoroughly and can apply them appropriately. No riding, all based on care of horses. Strong rider able to ride a variety of mounts. High standard of horsemanship and general knowledge. Particulars of all certificates may be found in the Australian Pony Club ‘‘Syllabus of Instruction’’ available to download below. PRE-REQUESITES: Standards D, C, C* or K, B - Horsemastership, B - Riding, and A, must be gained in that order, i.e. each is a pre-requesite for the higher standard, There is no pre-requisite for the H Certifcate and the E Certificate is optional. ASSESSOR: An Assessor within a Club may test for E, D and D*. Each State must have a panel of Assessors for certificates C and above. Assessors should not test in their own Club unless circumstances, such as excessive distance, make this necessary. To remain on the Assessor's Panel, Assessors must be active members of a Pony Club and attend current refresher courses conducted by their State. The names of Assessors on the Panel will be reveiwed by each State every three years. ASSESSMENT CREDITS: Any section of a Test passed by the candidated will be held as credit/s until such time as all sections are passed (maximum two years from original practical Assessment date). CERTIFICATE MANUALS: Certificate Manuals are available for D/D*, C, C* and K. The Manuals follow the PCA Syllabus of Instruction and course content and are designed to help the Candidate prepare for Assessment. They will be used as part of the assessment process as evidence that preparation has occured. WORKSHEETS: Worksheets are available for B, H and A which guide Candidates throught the Syllabus requirements. There is no course content in the worksheets as it is expected that Candidates at this level will gather their knowledge from a variety of sources. SUPLMENTARY TESTS FOR PRACTICAL SECTIONS: Supplementary testing, if required may be undertaken at a time agreed by Assessor and Candidate once the Candidate is deemed to be ready. Candidates must be assessed to have reached the standard required prior to re-presenting for the practical tests. Where possible one of the original Assessors should be used for the supplementary test. The supplementary test must be organised in consultation with the State Panel. Candidates must wear formal/competition Pony Club uniform for presenation and discipline appropriate unifrom for all practical tests. Presentation of horse - See individual Test. HORSES: Horse and rider combinations for practical assessment must have attended a minimum of 2 working rallies and must be the rider's qualified mount as per State/Territory Rules. 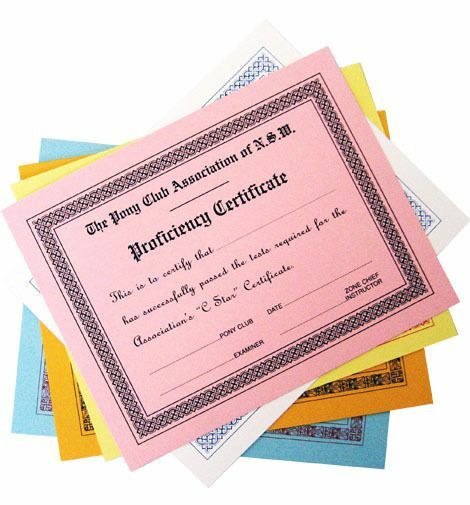 CERTIFICATES AND CLOTH PATCHES: Certificates and cloth patches are available from the association office for presentation to members gaining certificates. Cloth patches are to be worn on the right-hand sleeve of shirt or jumper above the elbow starting with D at the top.